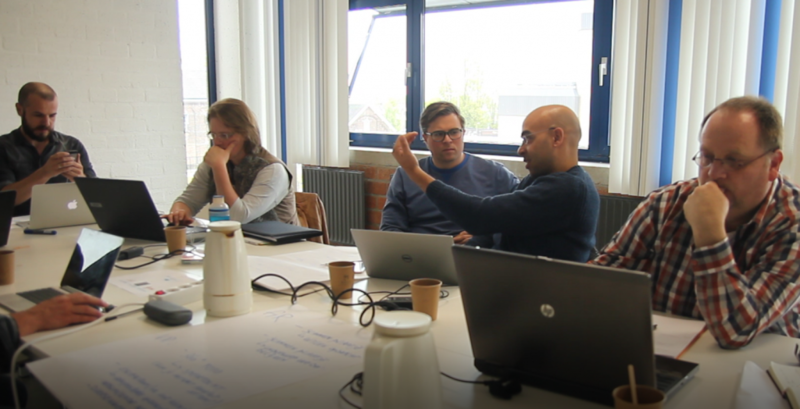 In April, professionals from all across Dutch educational spectrum took part in our Masterclass “Virtual Reality in Education”. Over the span of four sessions, we discussed in what ways VR could provide innovations in education, followed by the participants figuring out for themselves how to utilize and create VR applications. Aside from teachers in primary-, secondary- and higher education, some of the participants revealed a background in business, allowing a wide variety of knowledge to be shared between different fields. Participants shared their thoughts on how they would like to apply VR to education. One participant suggested teaching a musical lesson in Virtual Reality, another saw the opportunity to educate primary schools on media literacy, while a third proposed to apply VR to the secondary vocational education (“MBO”) of electronics technicians. “In any case, I’m taking home a lot of new ideas and inspiration”, claimed an enthusiastic Malika, who aims to establish a VR-lab at her own school so as to help education progress. With the knowledge gained from the Masterclass, participants are now able to start using VR for themselves. By making use of existing tools in VR, educational material can be attached to 3D-models and virtual tours can be made. While not technically complicated, these applications can nonetheless be a significant addition to education. All in all, it was clear that the possibilities are endless and that this only marks the beginning of educational VR. Wish to join a Masterclass Virtual Reality in Education for yourself? New editions will commence in September 2017!